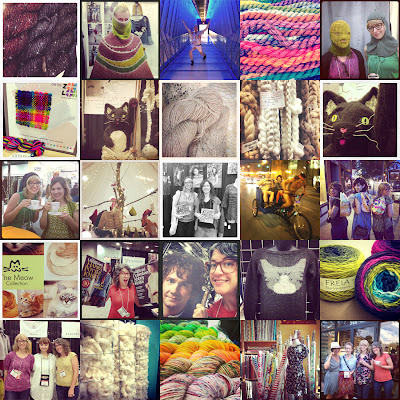 Fancy Tiger Crafts: TNNA Columbus Fun 2013! 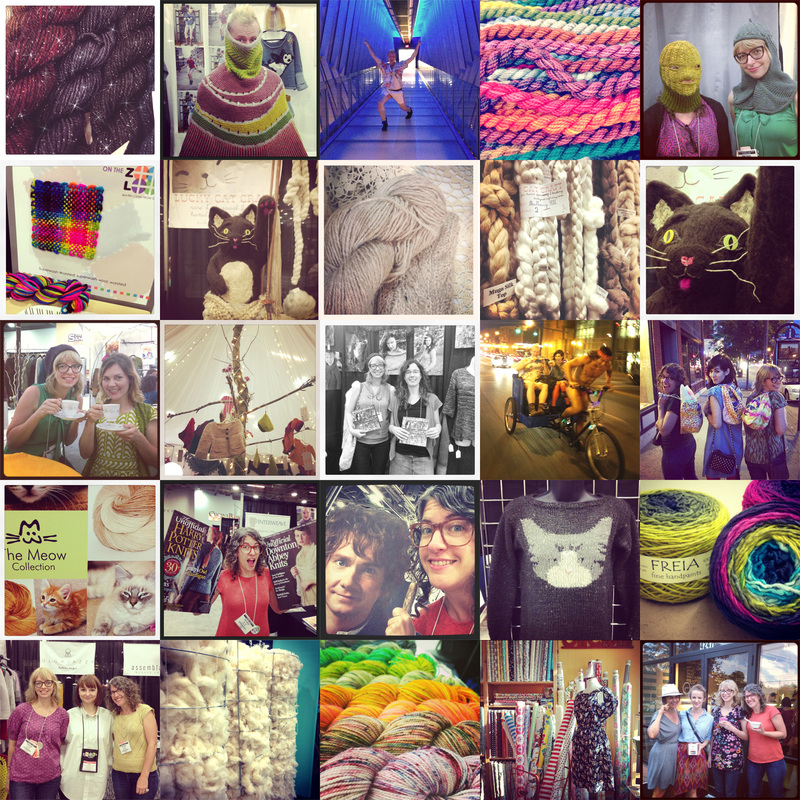 Jaime and I had a pile o' fun and saw a million exciting new yarny things at the TNNA trade show in Columbus last weekend! We debuted six new patterns for our Heirloom yarn, and re-released our classic My Favorite Sweater pattern--now featuring Heirloom as well. (1)Nebula--the newest yarn from Anzula--is a sparkle yarn that we ordered in dark, moody shades. Look for it to hit the shop in August. (2-3) Funtimes were had with Stephen West, designer extraordinaire and very fun person. (4) New colors were ordered in Madelinetosh + there is a new yarn coming that you will love! A.S.A.P. is Madtosh's new chunky yarn set to arrive in November, just in time for last minute gift knitting. (5) Jaime and I had the joy of trying on samples from Annie Modesitt's book, History on Two Needles. Knit replica of the Sutton Hoo ceremonial mask? Amazing. (6) The folks at Schacht are geniuses, they distributed the Zoom Loom (which we currently have in the shop) for all the yarn companies to swatch up their yarns! We loved seeing how yarns from different companies worked in this little loom-ette. Our favorite was Knitted Wit's mini rainbow skeins--those will be coming soon for Zoom Loom-ing, knitting, crochet or embroidery fun. (7-10) Lucky Cat we love you! We ordered some special fiber braids from this adorable spinning fiber company--crazy soft blends that include Possum, Angora, Yak, Camel down, Wild Silks and more! Look for these buttery soft blends in a few weeks. 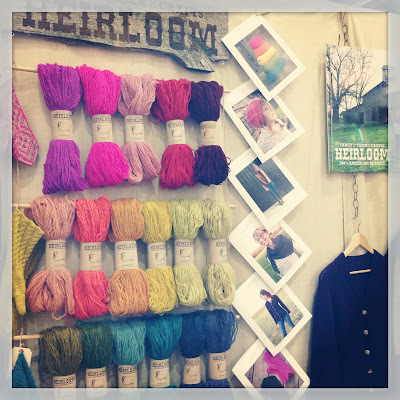 (11-12) The Crafty Diversions booth was full of exciting things, like teatime with Ysolda! She has a book in the works that is going to be amazing! Miriam Felton was there with her upcoming collection, Modern Colorwork. We can't wait for all the exciting things these ladies have in the works! (13) Carol Feller was signing copies of her soon-to-be-here book, Among Stones. (14-15) Funtimes were had with Cirilia Rose, including a pedicab race (which, btw, Jaime and I won) and exploring the streets of Columbus with our Stephen West knitting bags. (16) The Meow Collection. Do I need to say more? Well okay, this hand-dyed BFL sock yarn comes in a range of colors based on our feline friends' coat colors. PLUS, $4 from every skein is donated to the Meow Foundation, a no-kill shelter helping abandoned cats find happy, permanent homes! (17-18) Nerd alert! Jaime and I are so excited for the upcoming special issue Interweave magazines: unofficial Harry Potter Knits and Downton Abbey Knits! Also, Jaime found a hobbit. (19) One of The Fiber Factor challenge sweaters. Of course, Meghan Navoy's cat sweater is my favorite pick! We can't wait to see the judging of Challenge 2 this Friday, with Stephen West as one of the guest judges! (20) Freia Ombré and Freia Flux yarns will be here in September with all their soft stripey goodness! (21) Jaime and I were happy to meet one of our favorite designers, Olga Buraya-Kefelian. She has new patterns arriving soon and we want to make them all! (22) A wall made of wool in the Blue Sky booth. (23) Look for the speckly goodness of The Yarns of Rhichard Devrieze in the shop in September. (24-25) What! We even got to go visit with Anita of Sew to Speak and April Rhodes at their sewing shop in Columbus while we were there! Keep an eye on our blog, instagram or facebook to be the first to know when all the newest goods arrive!